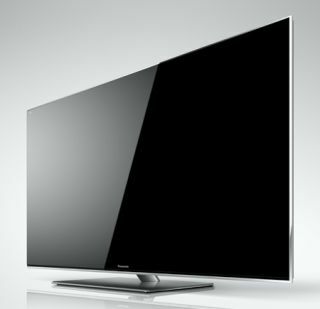 CES 2012: Panasonic TVs focus on picture quality and slicker controls | What Hi-Fi? Slimmer, premium plasmas, larger LCDs and 3D sets in both active and passive formats join Panasonic's 2012 TV line-up. Users get fresh control options in the shape of an innovative smartphone/tablet app plus a touch-pad remote control handset. We don't yet have any exact details of UK model numbers, specifications or pricing - that will all be revealed next month at Panasonic's European Convention, from which we'll report live - but the US launches are a good indication of the core technologies and developments. Refreshingly, Panasonic is one of the few TV manufacturers here at CES to be talking about better picture quality as well as how slim its screens are and what apps they run. Maybe it's because - unlike some rivals - Panasonic did not have its own consumer OLED TV ready to launch (though it is showing a stunning 20in 4K monitor, and will have a bigger OLED set later this year), plus the Viera Connect content offering remains relatively sparse compared to some Smart TVs. Anyway, it's great to see picture quality - alongside Eco concerns, connectivity, ease-of-use and design - being the first of the five components of Panasonic's new "Smart Viera" strategy. Even if that strategy was delivered in such a confusing manner at the press conference that many thought Smart Viera was a rebranding of Viera Connect! Panasonic seems confident its 2012 sets are a signficant step forward in all those five areas - so much so that its new model numbers skip a decade from 2011's '30 line-up to this year's '50 series. Despite previous protestations that LCD was best kept for smaller sets and plasma for larger TVs, Panasonic has extended its LCD line-up to include larger models, including 3D designs. The US gets 47- and 55in screen sizes, as well as smaller options, plus a new WT50 flagship range. Another change of heart comes with 3D, where passive plasmas sets join the active-shutter line-up. Why the U-turn? Giving customers the choice of a cheaper option, says Panasonic, while stressing that active 3D remains the 'quality' choice. The VT50 (shown at top of page) becomes Panasonic's flagship plasma model. A slimmer, sleeker TV than last year's VT30, with a new style of stand, the VT50 has won a CES Design and Engineering Award. Panasonic says its picture quality upgrades include "an advanced pre-discharge technology that enables higher contrast in dark areas.. In addition, the TV’s Infinite Black Pro Panel consists of a new cell structure and phosphors, resulting in improved luminous efficiency and higher brightness and contrast levels." The company declined to comment on whether these improvements would tackle some of the reported picture issues with previous models. Panasonic may have slightly less smart TV content than some rivals, but it wants to make what it's got a better experience. So its engineers have done a lot of work on enhancing the picture quality of streamed/web content - such as BBC iPlayer. We look forward to testing that in action. 3D performance - for both the active-shutter sets and the new entry-level passive models - claims to have been improved, too, and some models also now include 2D to 3D conversion. Panasonic declined to comment on the screen sizes coming to the UK - or indeed which TV ranges - but did note that there has been some 'rationalisation' of the line-up; there will be fewer different models on sale this year. In keeping with the 'eco' element of Smart Viera, all the new sets - LCD and plasma - will use less power than previous generations of TV. Another element that sets Panasonic apart from some of its rivals here at CES is the lack of gesture or voice controls for its new generation of TVs. The company claims it did look into it, but following a lot of customer research it decided not to implement it. It firmly believes TV is a 'sit back' experience that shouldn't have to require too much input. However, Panasonic has developed a few new ways that users of its 2012 products can more easily interact with their entertainment. Firstly, some of its TVs and Blu-ray players/systems will have touchpad remote controls (see the Blu-ray remote pictured right). These can both display a keypad with the usual buttons, or be used just like a laptop's trackpad, making it easier to navigate Viera Connect's online content and web access. Secondly, users can choose to control their new Panasonic product via a app, which will be available for both Apple and Android mobiles and tablets. Finally, Panasonic's 2012 Blu-ray products (see the news story here on the audio-boosted player line-up) get a neat control app - best viewed on a tablet - with some interesting features. The apps have a range of looks and feel, including this lovely retro 'valve' audio interface including several EQ modes and six levels of 'Digital Tube Sound' DSP, should you desire. We'll bring you more on the full Panasonic line-up - including expected pricing and availability - from the European launch next month.